One of the new features in the second edition of The Next Level is a series of sidebars called Coachable Moments. Each of these Moments offers a context specific, road tested coaching tip that you can use to increase your leadership effectiveness or that of leaders you’re coaching. 1. What will things look like twelve months from now if we’re completely successful? 2. What are the 20 percent of the things that I need to be spending 80 percent of my time and attention on to create that future state? 3. What are the 20 percent of the things that I have been spending 80 percent of my time on? 4. What’s on the list from question 3 that I need to let go of and have my team pick up? 5. What will my team need to let go of to create the bandwidth to pick up the things I’m turning over to them? Give it a try and let me know what it does for you and your team. These are some great questions! I answered them for myself as a solo-preneur, and have made these part of my 2011 work plan. Thank you! 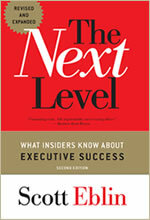 Find out what insiders know about executive success in Scott Eblin’s new and expanded book, The Next Level: What Insiders Know About Executive Success. Leadership Lessons Podcasts: Scott Eblin, executive coach, speaker and author of The Next Level: What Insiders Know About Executive Success, 2nd Edition, talks with top business and organizational leaders. As an executive coach, speaker and author of The Next Level, Scott Eblin advises hundreds of executive leaders every year. The Next Level Blog is where he shares "news you can use" to raise your leadership game. Debbie on Are You Accountable or Responsible? Sandra Goodyear on Are You Accountable or Responsible? Gayle Ely on Are You Accountable or Responsible? Mike Henry Sr. on Are You Accountable or Responsible?